Entries must be made by 4/6/18 at 5:00 PM. Winner will be announced and contacted by Facebook Messenger on 4/6/18. Contest begins on 4/4/2018 and will end on 4/6/2018 at 5:00 pm CST. One (1) winner will be selected at random from entries on Facebook.com/Cavenders, and one (1) winner will be selected at random from entries on Facebook.com/RockandRollCowboy. 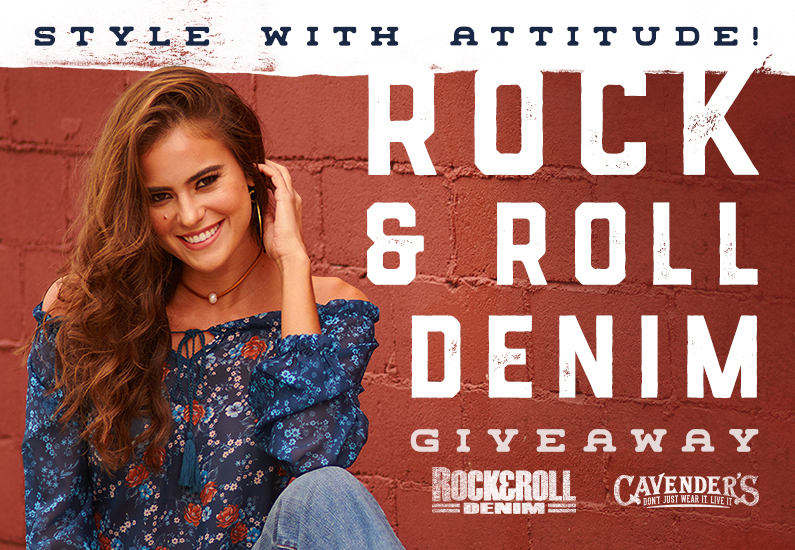 Each winner will receive a prize of one (1) pair of Rock & Roll Denim jeans, one (1) Rock & Roll shirt, and one (1) pair of Cavender’s brand boots valued up to $209.99 (excludes exotic leather styles). To enter, visit Facebook.com/Cavenders and Facebook.com/RockandRollCowboy. Like both Cavender’s and Rock & Roll Cowboy Facebook pages, and leave a comment on either pages’ giveaway post. No purchase necessary to win. Cavender’s will only use personal information to notify you if you are chosen as a winner. Winners will be selected at random. Odds of winning depend on the total number of entries received by the due date. Winners will be notified via Facebook Messenger by a representative of Cavender’s or Rock & Roll Denim. Winner must respond to notification in order to receive the prize. In the event that the winner does not respond within 7 days of notification, a new winner will be selected at random. Prize will be mailed to the winner as soon as a response to the notification is received. Prize is not assignable and nontransferable. No substitutions allowed by the winner. Prize is not redeemable for cash. Winners are solely responsible for reporting and payment of any taxes on prizes. Winners will be posted below after the completion of this contest. By entering this contest, you agree to be bound by these rules. Winner releases Cavender’s, Rock & Roll Denim, the prize manufacturers, and each of their affiliates, officers, agents, and employees from any responsibility or liability in connection with any loss, accident, or death incurred in connection with the use of the prize won in the contest. Any tax liabilities are the responsibility of the winner only. Prize is not exchangeable, transferable, or redeemable for cash. Cavender’s reserve the right to cancel, modify, or suspend the contest at any time, reject any entry, or make any revisions to the official rules as we deem necessary. This Sweepstakes is available only through Facebook.com/Cavenders. Entries must be submitted by February 14, 2018 at 5:00 pm CST. The winners will be contacted by Facebook direct message by February 15, 2018. Entries must be submitted by June 19th at 10:00am CST. The winner will be contacted by direct message on Facebook and Instagram by Cavender’s.